The system setup menu is often used for adding new users, controlling access settings, and customizing the lookup lists used by system. 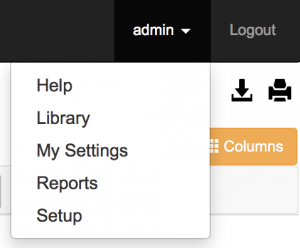 If your user profile is setup with Administrator Authority (SysAdmin), the Setup link will be displayed under the drop down in the upper right-hand corner of the display screen next to the left of the Logout link. If you do not see the Setup link, then your user profile does not have the authority to access the system setup area. Menu options that relate strictly to functions available in the Pro Edition are indicated by the use of (Pro) following the menu option. To learn more about each of these menu items individually, please search the Knowledge Base with their titles.